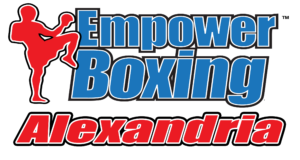 Fall Quarter for Alexandria Martial Arts program will begin on Tuesday, October 2, 2018 with classes beginning at 4:45 pm. This program is a white to black belt level and beyond martial arts program that is designed to challenge you to become the best version of you. Students will begin the program learning basic Taekwondo skills and drills with traditional material for belt advancement. As a school, we not only want to teach students about the wide variety of martial arts training that exists in the world today but also give them the skills they may need to keep themselves safe for any number of attacks and threats. We know that we will not be able to keep everyone safe but we want to give you a confident base set of skills you can use to stop most threats. 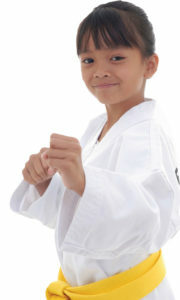 These programs are for the school-age martial artist who is 6 to 12 years old. More information on the specifics of each program coming soon. Our Level 1 Program for students of at the rank of Beginner through Yellow belt will give students a firm foundation of Taekwondo skills to build upon. Students will learn basic Taekwondo kicks, one-step defenses, and beginner-level Taekwondo patterns. Each month during the fourth week of the month, students participate in Stripe Evaluations. This is where students are evaluated on the material they have been learning that month. Month 1 is Kicking action, Month 2 is One Step and Self-Defense, and Month 3 is patterns. Are students guaranteed to earn their stripes each month? No, they must demonstrate they can perform their techniques to a level of proficiency adequate for their current level. White belts have a lower proficiency requirement than yellow belts. Each student will earn the necessary stripes for their rank advancement. Once they have earned the stripes necessary for advancement. They graduate to the next level. Rank Graduations are included in the monthly tuition cost as well as all stripe evaluations. Are you ready to enroll your student in our Level 1 program? Use the following link to enroll in the Level 1 Martial Arts program. Our Level 2 program for the Intermediate student Green to Red belt will follow the Level 1 program but increase the challenge on students by incorporating traditional martial arts weapons of bo, sai, nunchaku, and kama. At this level, students will be introduced to submission grappling. Material from wrestling, Judo, and Brazilian Jiu-jitsu will be incorporated into a student’s training to help them not only learn about the wider scope of martial arts in the world but also to give them greater skills to keep themselves safe. This program is not an additional program to add to your weekly schedule but it is the program our Green Belts and above are part of every week. Olympic-style sparring will be introduced at this level through the add-on competition team program. For more information about the Level 2 Black Belt Apprentice Leadership program, please see the following page. Remember that this program is for students at the rank of Green Belt and higher. Our adult program is a much more eclectic martial arts program. Adult students are exposed to the training of weapons at the beginning of their journey and begin grappling right away. Adults essentially do not start in the Level 1 program with the young kids but begin in our Level 2 Class to challenge them in a great way mentally and physically from the very beginning. We also know that adults want to find practical value of their training right away. There is no limit to when you can start martial arts training. It is acceptable at any age and ability level. This is a boxing, kickboxing, and martial arts program unlike anything else in the area. We teach real boxing and kickboxing skills in order to give you a fundamental set of skills to stay safe in today’s world. You are not doing cardio kickboxing or dance boxing, you are doing real boxing and kickboxing on our heavy bags with real boxing gloves. Do you want to get more fit? Do you want to be less stressed? Do you want to learn to protect yourself? 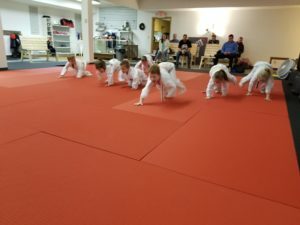 The Little Tigers Pre-School Martial Arts program is a developmentally appropriate class designed by a licensed Minnesota teacher for the youngest martial artists. Students use games and other fun drills to learn about coordination, balance, gross motor skills, timing, working together, introducing yourself, and following directions. Animal Drills with the Little Tigers. Crawling is a fantastic biomechanical motion for kids! Classes are limited to 10 students in each session so the students to teacher ratio never goes above 10:1. 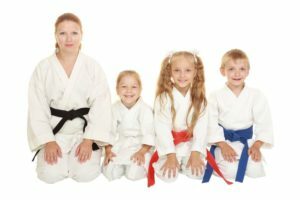 The Enriching Confidence, LLC Homeschooling Martial Arts program is a Taekwondo-based program during the day that allows the area homeschool families to enjoy the benefits of martial arts training in an environment of other homeschool families. Classes for this program take place on Wednesday afternoons beginning at 1:00 pm. For more information about the Homeschool martial arts program, please see the Enriching Confidence, LLC main website information page found here. Kayla Flynn is a NASM certified personal trainer who specializes in helping clients achieve their goals through specialized programs using minimal equipment. Her personal training services can help you reach your fitness and wellness goals. Sessions are 60 minutes in length and are tailored to each clients individual needs. Josh Waltzing is a 5th degree black belt in Taekwondo, licensed Minnesota educator, Level-1 USA Taekwondo certified coach. His training services focus on specific areas of martial arts and self-defense training. 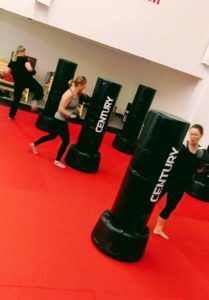 Sessions are 60 – 90 minutes in length and have several specialized areas; Taekwondo poomsae, Taekwondo sparring, boxing and kickboxing, groundwork, and self-defense. If you are interested in teaching a class or moving your program to our space. We have a monthly rental rate for the second level area. Improvements are in store for the space including dance mirrors and some extra storage. 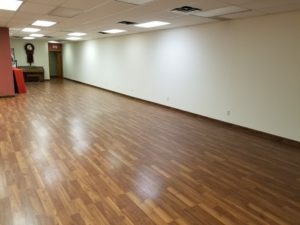 This is a limited view of the current second level dance space. More photos coming soon. We are open to many types of dance expect styles like tap that involve a lot of floor impacts. The itself floor and the programming below it do not lend well to these types of dance. If you would like information on using the second level for a dance program, please contact us and we will be glad to discuss it with you.